Behind the Scenes: Gazebo. Frankenmuth, Michigan. Scenario: Wonderful park in Northern Michigan. Detective and a uniform police officer walk over the hill and approach Linda and I.
Detective: What are you doing here? Me: Making a photograph for an art project I am working on. Linda: Let me show you what we are doing, Linda shows them my portfolio. Police: Well, we received a call from the elementary school over hill and they said a grown man in a tutu was dancing around in the park. 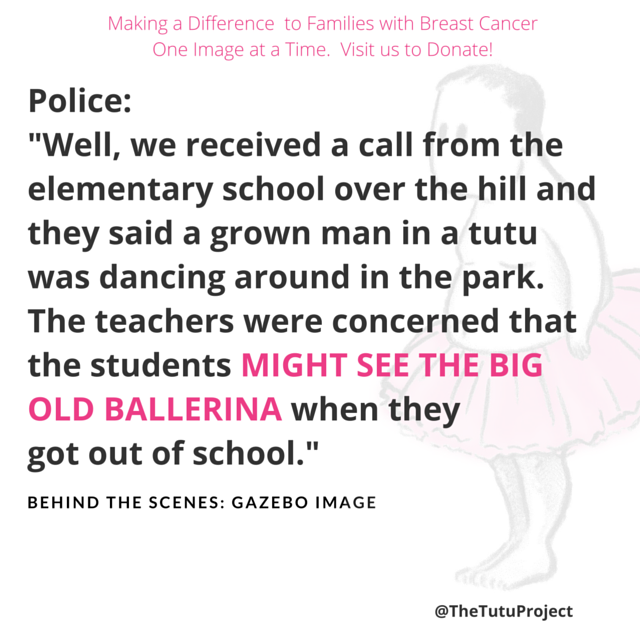 The teachers were concerned that the students might see the big old ballerina when they got out of school. Me: So what would you like us to do officer? Police: As long as you are out of here by 3:00pm there is no problem. Me: Thanks officer but I think we already got the shot we need, so we can leave now. Police: Okay great, have a nice day! Every purchase donates to the Carey Foundation for families with breast cancer. Support us Today!